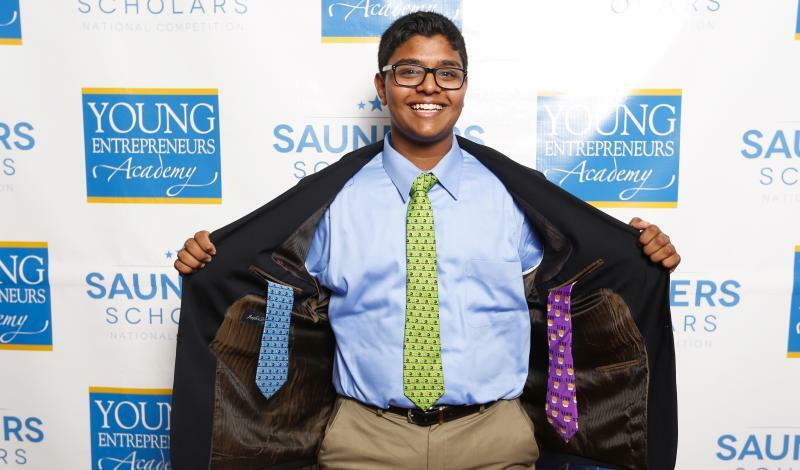 Archmere Academy high school student Shreyas Parab was named a finalist in the Young Entrepreneurs Academy’s Saunders Scholars Competition and is preparing to head to Washington, DC to compete for up to $50,000 in college scholarship funding and business prize packages. Parab’s journey to the national competition began when he was named the local Young Entrepreneurs Academy (YEA!) winner of the competition hosted by the National Association of Women Business Owners (NAWBO) of Greater Philadelphia, Parab was awarded $800 by local investors to launch his business, NovelTie, a company that makes unique neckties, such as “stud muffin,” and “chick magnet,” using symbols, icons and words. He got the idea because his school requires boys to wear ties. “My company strives to make every occasion where you have to wear a tie into an event where you get to wear your NovelTie,” says Parab, who also recently won the Diamond Challenge for High School Entrepreneurs. “It’s something very few kids get to say, but, I am a small business owner,” says Parab, who participates in the 30-week YEA! class hosted by NAWBO of Greater Philadelphia. “Through YEA!, I have learned basic and advanced lessons from experienced business leaders, entrepreneurs, and mentors. I now know how to perfect an elevator pitch, write a comprehensive and thorough business plan, network with professionals, turn a business into a legal entity, and more importantly, I learned the dedication and determination it takes to be an entrepreneur, a small business owner, and a member of the professional world,” says Parab.